Wedding Jewelry!! I have never been asked to do wedding jewelry before. But when Kylie Parry asked to make her a wedding necklace to go with her beautiful dress for her wedding in January, I jumped all over it. I love Kylie's work, respect her big time for her artistry, am completely flattered she asked me, and she's cute as a button so why wouldn't I!? 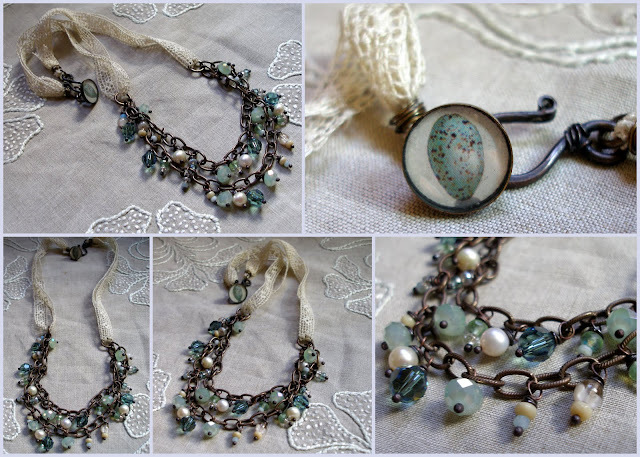 She had really liked this bracelet when it was in my shop, and we planned the design around this style, using glass beads, brass chain, and vintage lace. I contacted my friend Sab at BeadBead, and she came through like a trooper! I luckily picked out all the right colors, and when I put it together yesterday I added in a few freshwater pearls. The beads are all wire wrapped on handmade eggplant head pins from E2S Supplies. I forgot to add a little signature owl tag, will have to do that before I ship it out. Adding a bit of blue, as tradition warrants- a blue birds egg resin clasp from Amanda Davie. The egg signifies Kylie's "new life" that she'll be starting with her husband. Luckily, she loves it! YESSSS! Quit the museum and do this for a living!!! I wasn't planning on getting married anytime soon, but I would almost change my mind in order to wear something beautiful like this. Lorelei - this is beautiful. The colors are wonderful and it looks as if it will drape beautifully. so very pretty. you are the sweetest. It's really lovely. What a special piece. Wonderful necklace!! I absolutely love it!! Wow, fantastic necklace and really special! Great job! I am such a sap! You made me teary!!! Beautiful piece...makes me want to get married all over again just to have a necklace like that! Great job Lorelei! Really!? You don't do wedding jewelry? I think that you may have found a new niche. The first big project I ever did was a wedding for a friend (which was coincidentlly the first piece I ever had published in Bead Trends). I did all 8 bridesmaids different, because they are all different people, and the bride and three special friends. It was awesome. Wish I could do more of that. This is absolutely fabulous. I think you hit this one right out of the park. You are so amazing. I just want to reach out and touch your work. Beautiful, earthy, can't wait to see pics of her in her gown with your beautiful art on. Hoping life is smoother this week! Kylie is going to be a lucky and very beautiful bride in this necklace! It's just stunning. You've done an amazing job! Can you get a picture of her wearing it with the dress after the wedding? Would love to see that. I like it a lot. So pretty and wedding-perfect! I love it! Gorgeous necklace!!! Worthy of any beautiful bride! I love the feeling of this. The whole piece just comes together beautifully. I love it Lorelei, and I am sure Kylie will too.